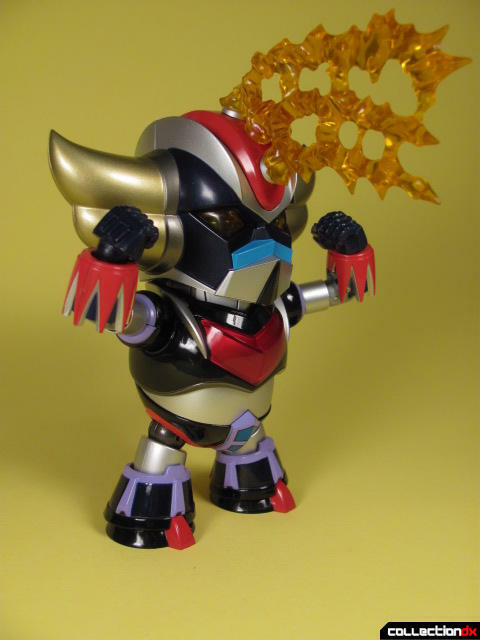 Grendizer was graciously provided by Angolz! Get yours there! 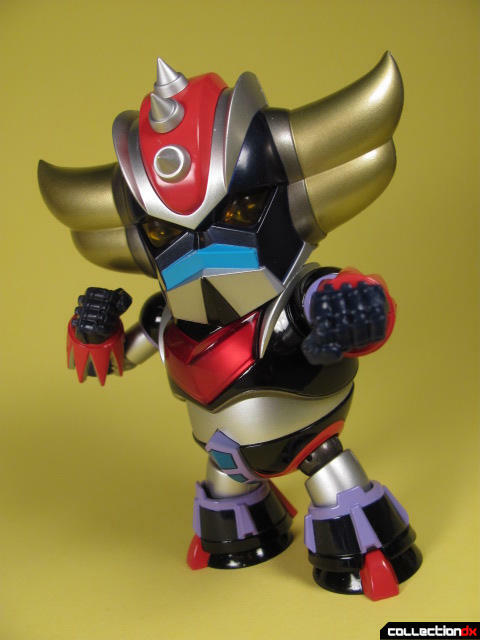 Secret weapon of the planet Fleed, Grendizer is the robot piloted by Duke Fleed. The Grendizer is sought for its great power and destructive capabilities by the Vegan Empire, and they will stop at nothing to get it. Duke flees to Earth to escape the Vegan Empire only to be found once again by King Vegan. 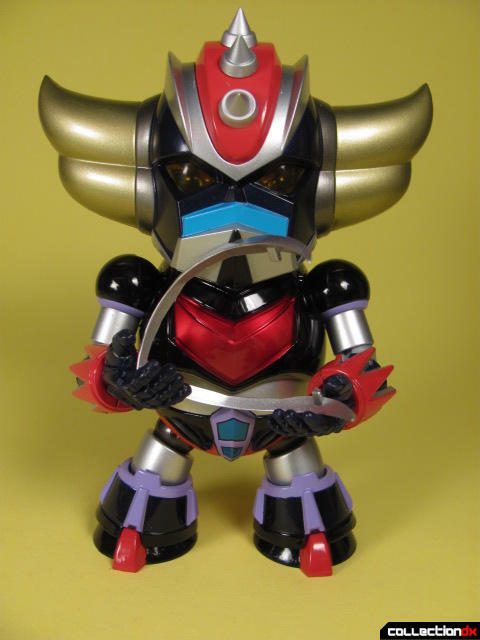 Duke must now fight to protect the Grendizer and the Earth. 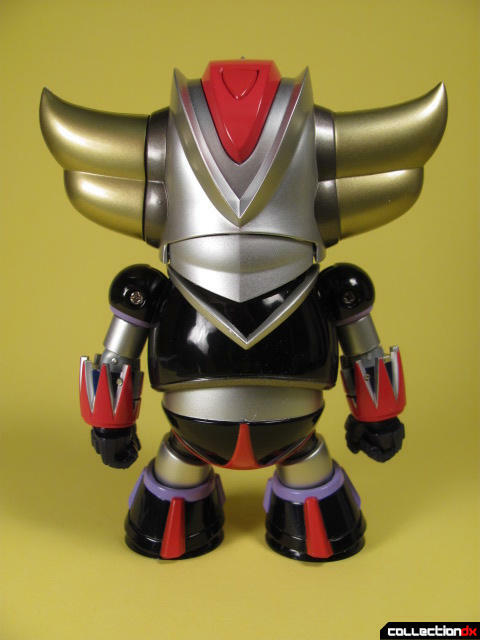 With this, Metal Box and Yamato give us Grendizer from the Toei Super Robot show entitled UFO Robot Grendizer. Made in SD proportions with some excellent engineering and copious amounts of metal, Grendizer is sure to please the Grendizer and SD fan alike. The box is oblong and blue. Simplistic and good picture and text placement make it a nice little box. 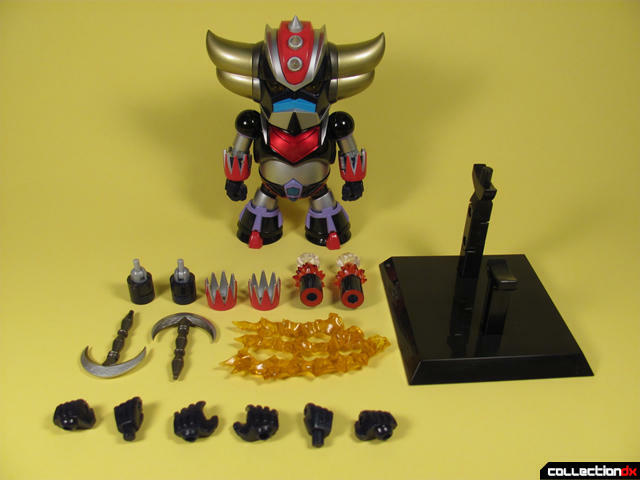 Grendizer’s colors are dark and a satisfying mix of shiny and matte with even a few translucent pieces. 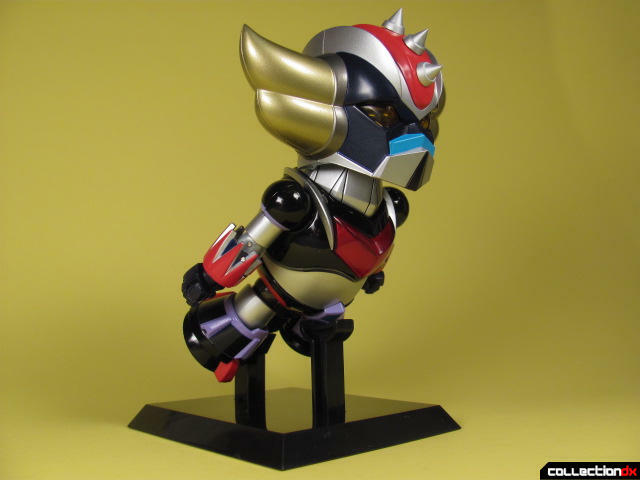 Aside from being SD, Grendizer is faithfully represented here in figure form. All his sharp angles, blocky-yet-rounded design, and other such defining bits as his wrist blades are here. His 1970s super robot colors are all present in their gregarious glory, but they aren’t all accurate to the show. For instance, the purple on his legs and crotch; that’s much too bright and saturated from the colors used in the television show. And the visor and horns on his face are also incorrectly colored. Not a deal breaker for most, but it is a point of contention. The paint is clean and suffers from only minor overspray and goopiness, namely around seams. Things aren’t super tight, but you’d have to get in close to see any discrepancies. 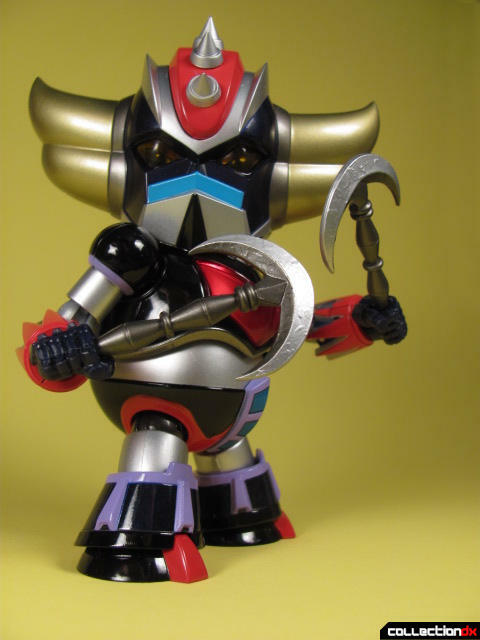 Grendizer also has a good amount of metal in his construction (a nice treat indeed). Located mostly in his center of mass, it gives the figure newfound weight and heft. Being SD, I wasn’t prepared for Grendizer to have this much articulation going on; there’s a lot of interesting engineering going on in here, too. 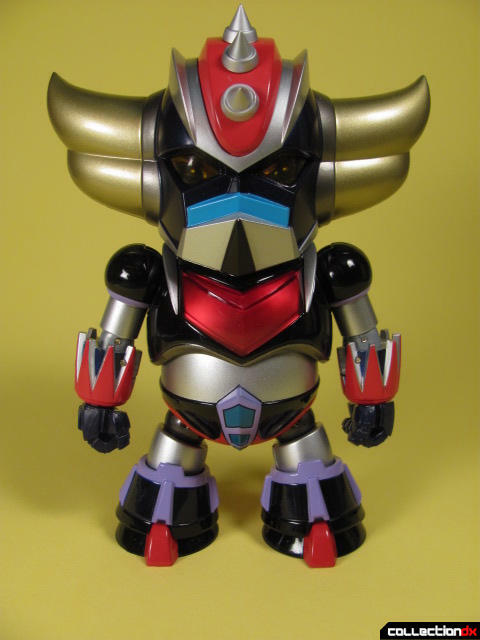 Along with the basics—double jointed head, ab crunch, universal shoulders and elbows, ball jointed wrists—Grendizer also sports a neck flap and neck extension joint for more extreme head movement and a sweet submerging hinge in his wrist blade to help move them out of the way (as his design doesn’t allow for such). His arms are my favorite part as they are sick! Sadly, the engineering basically stops at the waist down. That extra deep ab crunch? It can only move up and down and side to side; no left to right spin. And the legs? Well. . . they’re kinda bland. You have ball jointed feet and knees that don’t really do anything (his hips are universal jointed, though, so that helps). These legs aren’t significantly better than if they were static. They are minutely expressive, but they hardly do what legs are supposed to do. With that said, he still looks good in almost any pose you can put him in. 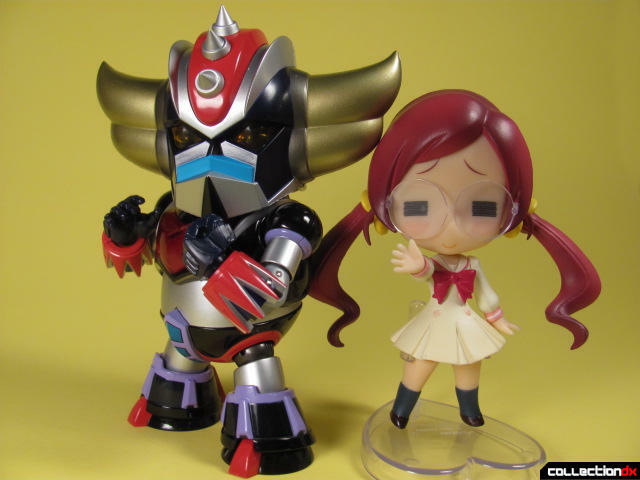 Grendizer stands at 4 ¼ inches tall. All of the accessories look as good as the main figure and are very easy to switch out with one another. I was surprised and pleased with this. The Space Thunder effect part was finicky to get to stay on at first, but after a few tries it stuck on like a champ. The stand, however, has some loose joints in it that cannot be tightened. Its primary use is to pose Grendizer flying forward (which it does well), but floating poses are harder to get to work; you need to put the stand arm in a Z shape for it to stand up. 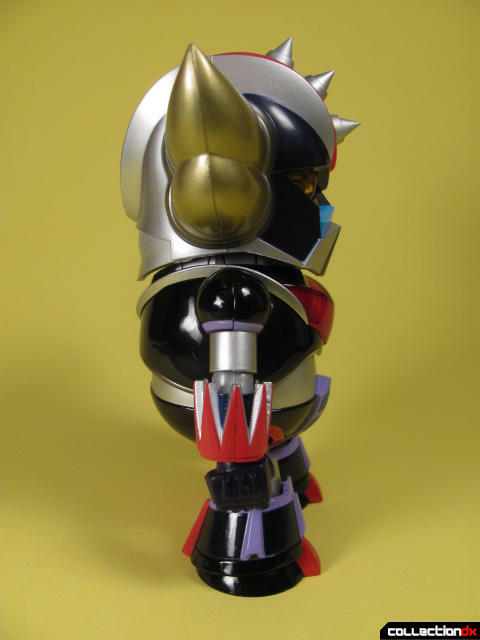 The sheathed Harken blades on Grendizer’s neck can be removed to be accurate to the show; a nice little touch. Grendizer comes with a pretty cool gimmick (as most Super Robots should): light up eyes. The effect is striking as it is excellently bright; however, the plastic for the eyes is—I feel—too translucent. It looks less like Super Robot eyes lighting up and more like carnival lights. If the plastic used were more milky then the illusion would be better captured. 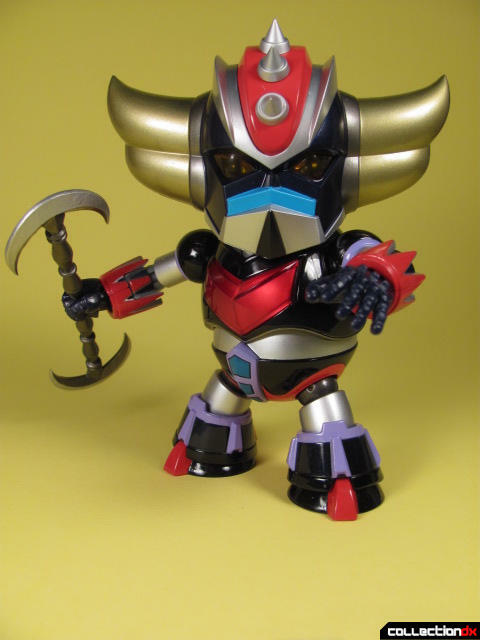 Grendizer is a neat, little, SD robo guy. With solid construction, luscious metal, beautiful engineering, and a wide range of accessories, he is very playable and very expressive. With only a few missteps to take into consideration—off colors, simple legs, not the tightest paint—Grendizer is a charming SD representation of a renowned robot. 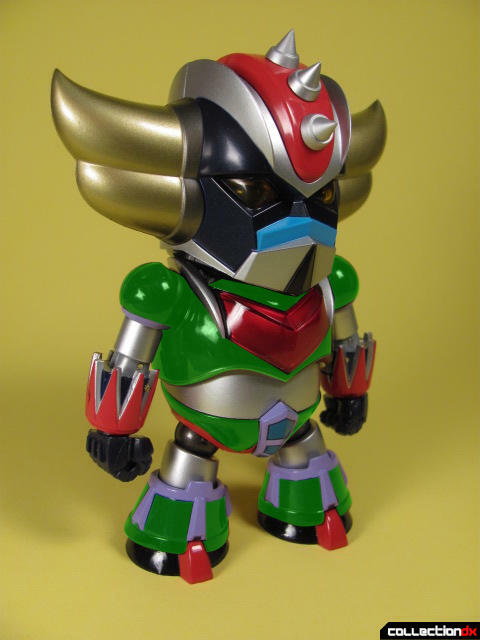 Whether you like SD or Grendizer (or both) this toy might be for you. One thing's for sure, if they make a spazer for this guy, they shouldn't have much difficulty fitting him inside it. Just grab a couple of pie pans and slam them together.